This made my day! It's long overdue! 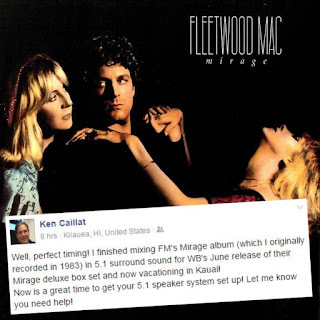 Rumours and Tusk producer Ken Caillat posted on his facebook page today that he started working on remastering Fleetwood Mac's 1982 album 'Mirage'. No idea when we can expect this and hopefully it doesn't sit on a shelf for a decade once complete, but it's movement forward getting past the Rumours and Tusk era albums. Now if only Stevie could take a look at her early work and remaster those as well. 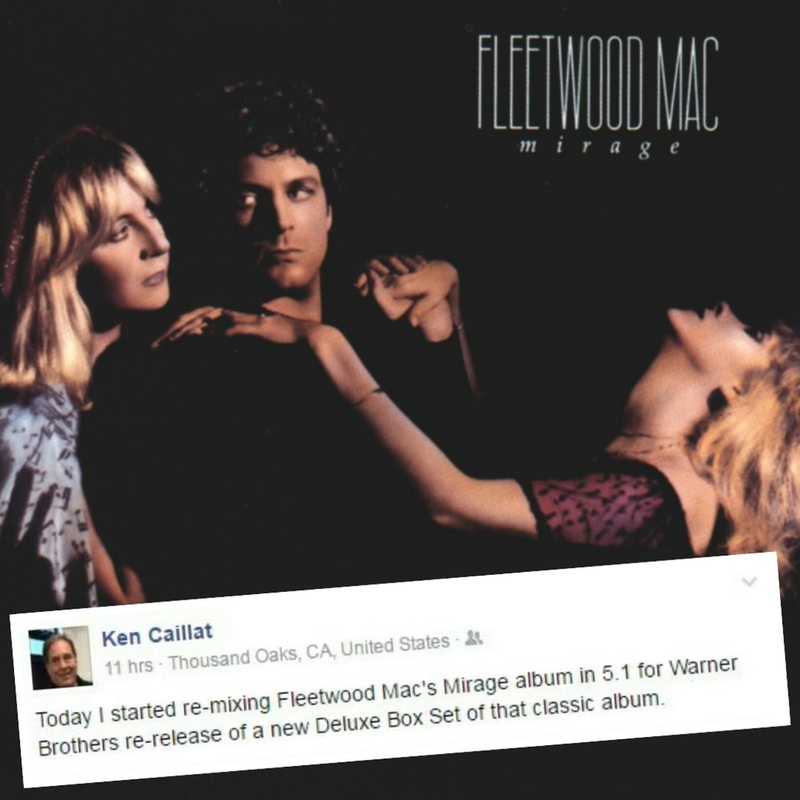 Looks like Ken is finished his part based on yesterday's facebook post. Exciting! Hopefully they include the Mirage concert DVD at the very least in this and not just the audio, although that's cool too... Remastering the VHS that was released in the 80's to DVD only makes sense if they are repackaging Mirage. 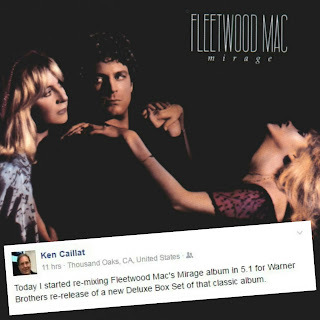 This may or may not be legit... but this is what is floating around the net regarding Fleetwood Mac's Remastered edition of Mirage. Take it with a grain of salt until it's been made official... which could be soon. YAAAASSS!!!! Hopefully this means 'Tango in the Night' isn't far behind!!!! Awesome news both discs are VERY overdue. My only hope for the deluxe 'Mirage' remaster is that Stevie is better represented on the demos/outtakes disc(s). Last year's deluxe 'Tusk' set featured six demos of "I Know I'm Not Wrong" and five of "Tusk" itself. Imagine what they could have included without that over-indulgence. The original demos for Stevie's "Smile At You," "Beauty And The Beast" and "The Dealer" originated during the 'Tusk' recording sessions. The 'Mirage' sessions produced the demo for "If You Were My Love" and what fans refer to as the "angry demo" of "Smile At You." I'm hoping those make the cut. Lindsey's outtake, "Goodbye Angel," which appeared on the 1992 boxed set 'The Chain,' could also be pulled for this project as well. I cannot wait to hear this album in crystal clear sound!! I just can't wait to hear "Straight Back" in 5.1 or just a new crisp full sound remaster. This is very exciting news. I hope they miss out some of the echo on the vocals -- can't wait for this. The big TUSK thing they just did was so redundant. It would be great if they release this with a tour video too. now if they could include a dvd with the music videos for "hold me" and "gypsy", i'd buy this up in a hearbeat! 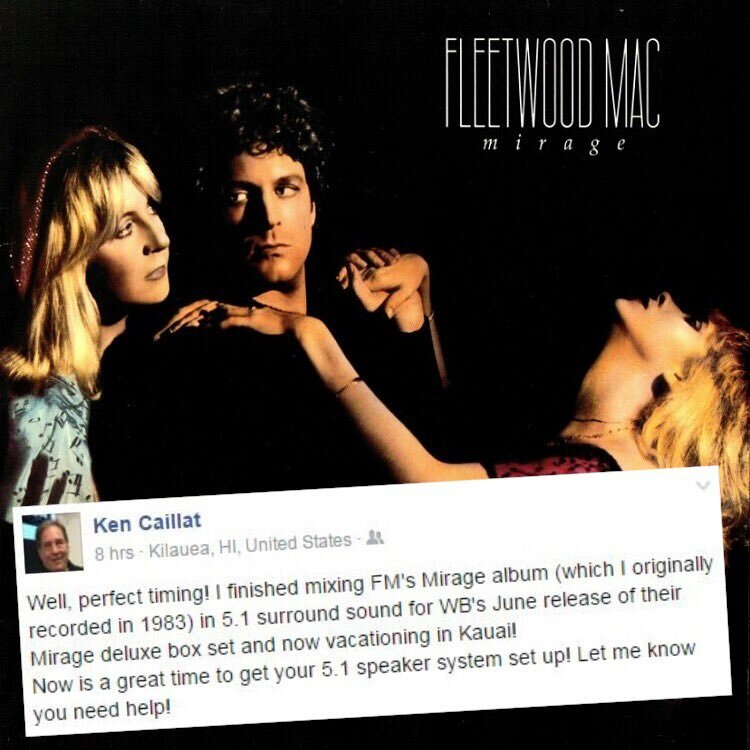 and, if they could find it in them to also put on that same dvd the "mirage" tour home video (the full one that was released on vhs and beta and not the hacked up on shown on hbo), that would be a fan's dream come true! 3. the unedited version of the "mirage" tour concert video (meaning the full version that was released on VHS and Betamax videotape and not the hackneyed version they put on hbo in 1982). Plus the un-edited alternate version of Gypsy, I mean how many more times do RUMOURS and TUSK need to be Re-Mastered and Re-Issued it's so pointless, MIRAGE is far more interesting work, Superb that it is now coming out, 1 down just TANGO IN THE NIGHT to go, all those B-Sides all those Remixes and 12" Versions, now that is a Re-Mastered Box Set!